Songbird Avenue and 56 of the most talented digi designers have come together to bring you a charity collaboration kit in support of Haiti's earthquake victims. The proceeds will go to Doctors without Dorders. 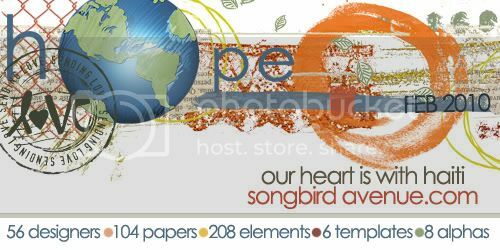 Songbird Avenue has raised over $36,000 for various charities since opening in 2007. Port Au Prince will be available for one month only, beginning on February 1st. Are you thinking about your scrapping aims for 2010? My words for the year (yeah, I couldn’t get it down to 1) are simplify and complete. In my scrapping that means I’ll be aiming for simplicity in my pages, stash organisation and completed albums. Last year I printed this one – check it out! I love the colours in the new charity kit from Songbird Avenue. It matches so well with our recent family photo portraits. Here’s the blurb on the new kit! ringing in the new year with a smile! We hope everyone is having a lovely first few days of 2010! We’re so excited to debut our first kit of the new year with you! We’ve teamed up with Kari Hentzelt of Scrapbook-Bytes to bring you an oh-so-happy kit full of sparkle and lovely designs! “Smile” is our January collaboration and all proceeds this month will benefit the Make a Child Smile Organization. Check out our sponsor page to get to know a little more about Kari. Stop by the site to see the new kit and take a peek at our inspiration gallery for lots of lovely layouts for our creative team members. Thanks for stopping by and have a lovely day!